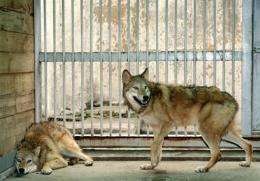 File photo shows cloned female wolfs, named Snuwolf (from the Seoul National University wolf) and Snuwolffy, in a cage at a zoo in southern Seoul. Snuwolf has died from an apparent infection, a professor who produced the clones almost four years ago said Tuesday. One of the world's first two cloned wolves has died from an apparent infection, a professor who produced the clones almost four years ago said Tuesday. Snuwolf (Seoul National University wolf) was found dead on August 26 at Seoul Zoo, Professor Shin Nam-Shik of the university told journalists. Snuwolf apparently died of an infection and had no other health problems, Shin said. "But we can't say anything for certain until we complete the analysis of autopsy results." He denied the death might be linked to a faulty cloning technique. "Sudden deaths among dogs and wild animals always happen. This death must not be blown out of proportion," Shin stressed. Shin is a member of the team from the university led by Professor Lee Byung-Chun which created the world's first cloned dogs in early 2005. The team also cloned two female wolves, Snuwolf and Snuwolffy, which were born in October 2005. Shin said Snuwolffy is alive and healthy at the zoo. Their feat was clouded as it was achieved under the stewardship of now-disgraced cloning expert Hwang Woo-Suk. But a probe by an independent panel confirmed the canine cloning was genuine.